Lock in a great price for Andronis Boutique Hotel – rated 9.6 by recent guests! Without doubt one of the favorite hotels I stayed in Santorini and the best in my life, before our arrival we received email to book the restaurant and spa, which make our stay more organized and we have enjoy the moments and we chose the pillow type and soap type, this details which obviously also added up to the experience. Upon arrival we were warmly welcomed by the staff, they was extremely friendly, the restaurant was amazing and the restaurant supervisor deserves a special thanks. We had two great evenings there. It was beautiful place and it was a relieve to walk in such a quiet and peaceful environment. The Cave was adorable and private. Many thanks for the arrangement for our honeymoon in the last night, the hotel surprised us really we enjoyed. Each room is unique, clean, view is great from each room, staff is beyond helpful, food is excellent. Best place!!! Views amazing, staff takes care of guests!! Pools or hot tubs nice addition to individual rooms! everything the staff was super nice and helpful they arranged everything all of them were familiar with the area and activity it is one of the best hotels I have ever stayed in, the breakfast so tasty and delicious. I would like to thank all of the hotel staff for their service and hospitality. Private hot tub overlooking the sea was a nice way to end the day. Clean, perfect location, great food, perfect staff. I have nothing better to say about this hotel. It is perfectly situated at the middle point of Oia and everything was perfect from check in to check out. The room is a beautiful cave and every room offers sweeping views of the sea, the volcano island and the famous sunset. Breakfast can be in room at an extra cost or free on the restaurant deck and is full of great choices. The staff may be the best part as they treat you like family and are happy to do whatever to make your stay the best. SO worth every penny - would stay again and again. the view of the hotel and the staff of the hotel very nice, specially for the reception people... they waiting for our coming until 22.00 at night. thanks a lot for yous kindness..
Andronis Boutique Hotel This rating is a reflection of how the property compares to the industry standard when it comes to price, facilities and services available. It's based on a self-evaluation by the property. Use this rating to help choose your stay! 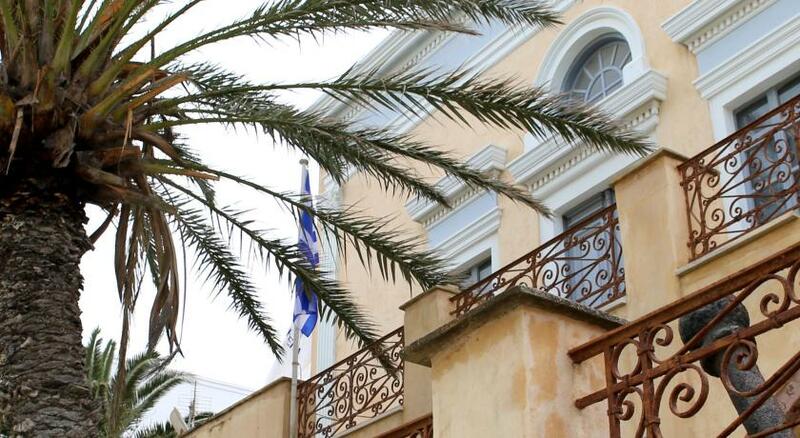 Andronis Boutique Hotel is set in the quiet town of Oia, 2.5 mi from Paradisos Beach. 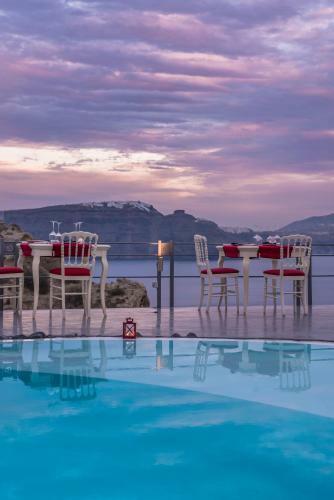 The spectacular views over the Caldera are coupled with facilities such as the hotel spa, swimming pool, organic restaurant and personalized services. Andronis suites reflect traditional Aegean style. With minimalist design and decoration, each features a private furnished balcony with sea view. Amenities include free Wi-Fi and LCD TVs, bathrobes and slippers, as well as a mini-bar with organic snacks. Fira, Santorini’s main town is 7.5 mi away. Santorini Airport is at 11 mi, and Athinios Port is at 12 mi. When would you like to stay at Andronis Boutique Hotel? This open-plan suite has private balcony overlooking the caldera. It includes an indoor or outdoor hot tub, a sitting area and cave-style bathroom with marble floors. Maximum occupancy in this suite is 2 guests. Minimally decorated suite offering a spacious terrace with hot tub and spectacular sea and volcano views. It features plush beds and a cave-style bathroom with hydro-massage shower cabin. Amenities include free Wi-Fi, bathrobes, slippers and minibar with organic snacks. Offering a private, plunge pool and shower with hydromassage jets, this air-conditioned and elegantly decorated suite opens to a terrace with Aegean Sea and volcano views. Fitted with whitewashed walls, it comes with a mini-bar and a separate, spacious living room with flat-screen, satellite TV. Free WiFi is provided. Offering a shower with hydro-massage jets, this air-conditioned and tastefully-decorated room opens to a balcony with Aegean Sea views. It comes with a minibar and a sitting area with flat-screen, satellite TV. Free Wi-Fi is provided. Offering a private, infinity pool and a shower with hydro-massage jets, this air-conditioned and elegantly decorated suite opens to a balcony with Aegean Sea views. It comes with a minibar and a separate, spacious living room with flat-screen, satellite TV. Free Wi-Fi is provided. Featuring a private infinity, plunge pool with unobstructed views over the Volcano, this air-conditioned soundproofing honeymoon suite includes a spacious living room with distinctive design and built-in sofas. A flat-screen cable-TV is provided. Featuring a private pool and caldera views, this elegantly decorated suite includes a furnished balcony, a seating area and a flat-screen TV. This executive suite of 70 square yards features a gracious terrace and secluded Cave plunge pool with hydro-massage jets, overlooking the infinite blue of the Aegean and the volcano. It combines Santorinian architecture with a contemporary flourish, this exquisite setting, whitewashed walls, sleek lines and imposing designer urns in shades of the Aegean. Boasting a heated cave pool with Caldera view, this 40-m² suite has a seating area with distinctive design and built-in sofa, as well as a uniquely designed bathroom with bathrobes and slippers. Facilities include a mini-bar, free WiFi and safe. This villa features a private pool, bathrobe and electric kettle. House Rules Andronis Boutique Hotel takes special requests – add in the next step! Andronis Boutique Hotel accepts these cards and reserves the right to temporarily hold an amount prior to arrival. Pricing completely out of sync. It’s an amazing hotel but it charges Dubai prices for everything when just down the road an amazing dinner or drink is 20% of the price. View is out of this World. Service in restaurant and bar area is better than a London 5* hotel and the concierge/reception bend over backwards to make sure your stay is awesome. The Parasol could have been positioned a little better to give some shade on the wonderful Balcony. Staff went above and beyond to make our stay enjoyable without being pushy they were always attentive and helpful. Steps, size of room, no plug ins, OVER Priced!!!! One of the best service providers! I didn't like leaving :-( Seriously, something that visitors should keep in mind is that there are many steps between street/reception and the rooms/pool/bar/restaurant. It is manageable, but could be a problem for some. We thoroughly enjoyed our stay at the Andronis boutique. We spent the first 3-4 days of our honeymoon and it was the perfect place to unwind in pure luxury. Loved our private jacuzzi. Loved every moment of staying in this hotel. The staff are very friendly, professional and personal. The rooms were stunning and I love that you get the option to choose your bathroom products and pillows before arriving at the hotel so it's all ready for you when you arrive. Will definitely be returning. Unbelievable views from all parts of the hotel. Staff was incredibly helpful and on point at all times.